More and more people are finding ways to work from home, either to replace a 9-to-5 job or to supplement the family's income. 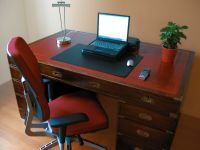 One of the best things you can do to help improve your chances to succeed is to establish a home office. 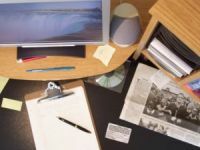 Not only is it a tax write-off (be sure to check with your accountant as to what you can and cannot deduct), but maintaining an efficient home office organization will help you be neat and more professional. The type of business you are running will dictate the type of office you need. Will you be having clients meeting you in your office? Will it be your workspace? Will it be a multi-purpose room? For example, if you have a business based mainly on a computer and internet, then you won't need as much space as you would for a craft production or product distribution business. First, eliminate anything from the room that isn't directly connected to your business (unless it is a multi-purpose room, such as a wall that serves as the family library). The fewer distractions you have, the better. It also helps reduce unnecessary clutter. Store things in boxes or move them to another room. Organizing office files can seem daunting at first. Luckily, There are many nice filing systems - from the traditional filing cabinets to hanging folders that can attach to the back of a door. Sort through all the papers in your office. Decide what you need to keep and what can be thrown away. When in doubt, set up another folder or box for things to look at again later. Once you establish a filing system, keep up with it on a daily basis. It is too easy to become overwhelmed if you don't. Color-coded systems work nicely for organizing office files. One color for tax-deductible related items, another for invoices to clients, another expenses, etc. Then you simply place the papers or receipts in the appropriate color folder. The workspace is often the most difficult to keep organized, but if you have a handle on the paperwork, it helps reduce one area of clutter. Make sure the workspace is large enough, and comfortable. Whether you have to sit or stand do to the work, make sure the surface is at the correct height. This will help reduce back strain and allow you to work for longer periods of time, thereby increasing your productivity. There are many nice desk organizers that allow you to keep items close at hand but out of the way. If you only keep the items you need most often on the workspace, it will also reduce clutter. Keep the rest tucked away in storage units in your desk drawer, shelf or box. There are drawer organizers that can be customized to meet your needs. All these can help increase home office organization. If you use a computer, make sure you have enough space for the computer itself, the monitor, printer and any other hardware you may need, such as scanners and fax machines. Many companies produce multi-purpose units that combine those features into one machine, which takes up much less desk space. Don't forget to organize the computer itself. There are many organizational software programs that can help you track appointments, clients, and your work. By using these programs, you can keep on top of things and waste less time. Set up special folders in your documents folder, so you can file things away for easy retrieval. Databases and spreadsheets are also very helpful tools in tracking your inventory and other business related needs. Return from Home Office Organization to Home Organize It!